Please note Masterclass topic change as advertised in the iHarvest Program. As an entrepreneur, you need to understand what laws apply to your new business. These should be addressed in your startup’s infancy. This masterclass will help to ensure your startup is complying with certain legal requirements from the get-go. Set up the right business structure for growth and exit, looking at sole trader, trust, and partnership. Value the importance of a good shareholder’s joint venture or partnership agreement, as well as how to protect valuable intellectual property. Understand restraints for key team members and whether they are enforceable. Register for this masterclass to learn the legal essentials for your startup. Lynne Grant is Special Counsel at Hunt & Hunt Lawyers and has worked as a corporate and commercial lawyer for 14 years. developing a particular specialty in acting in private business sales, mergers and acquisitions. Lynne has expertise across a range of complex commercial transactions, including legal due diligence, structuring, negotiating and implementing commercial contracts, joint ventures, shareholder agreements, governance and global trade. Karen Finch, CEO of Legally Yours fuses her legal background, recruitment expertise and passion for shaking up the legal sector and is passionate about facilitating faster, easier and more transparent access to fixed-fee lawyers in Australia. Through Legally Yours, Karen wants to provide greater access for the community to experienced, client-focused lawyers. HANNAH GEE is a senior leader who is passionate about building great learning cultures. A genuine collaborator, problem solver and leader, Hannah’s career has encompassed partnering with organisations to get great outcomes for and through people, technology and learning. Hannah hustles, develops individuals and teams and loves building stuff. THOMAS ANBEEK is a builder with a passion for entrepreneurship and startups. After spending a number of years as a management consultant, the Erasmus University and the Rotterdam School of Management engaged Thomas to aid in establishing the Erasmus Centre for Entrepreneurship (ECE). After moving to Australia Thomas became the first employee at Startup Victoria and was responsible for growing the community from 3,000 to 11,000 startup enthusiasts. JORDAN GIAN is a designer and thought provoker – but mostly a creative entrepreneur. With a background in design Jordan unknowingly used many Human Centered Design methods in setting up 15 SME’s before his 25th birthday. Jordan’s time is split between design commitments for leading global brands, running ecom businesses, hospitality venues and consulting on strategy and innovation. Register now to attend #iHarvestMasterclass #13 and secure your mentoring session. 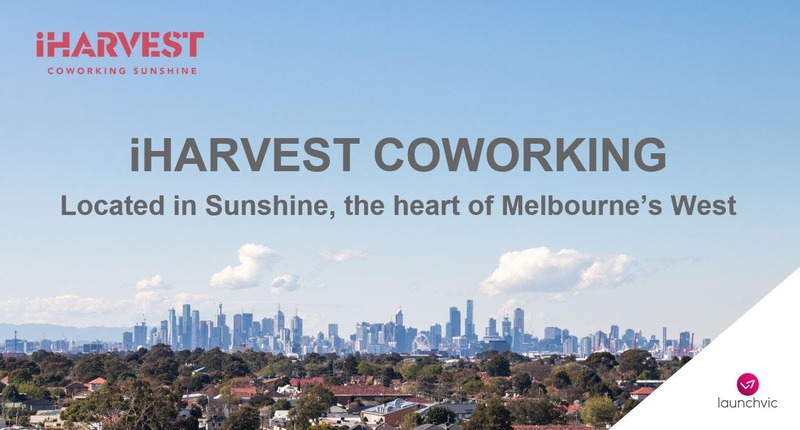 iHarvest Coworking is Melbourne’s newest coworking space located in Sunshine, the heart of Melbourne’s west. Hours 8am to 5pm, Monday to Friday.